begin schooling together getting ready to make their annual migration offshore. Big schools of fish can often be spotted from hundreds of yards away as they push the calm waters in the Pine Island sound. Pretty soon these fish will make their way right off our beaches where the schools can easily reach 100 plus fish. There’s not much more of an exciting sight for saltwater fisherman than seeing a school of hundreds of Redfish turning the surface of the water to a golden glow! They’ll usually eat just about any type of bait precisely cast ahead of them. Usually a large thread fin Herring or Gulf shrimp doesn’t make it out alive if tossed in the mix. Snook fishing can still be pretty good for us this time of year as well. The fish sense that water is gradually cooling down, and as a Tropical based fish, they start to make their way out of the passes and towards the rivers where the darker water retains warmth for the winter months. This time of year can also be awesome for our nearshore bite. We start to see schools of Kingfish terrorizing bait pods a couple miles off the beaches. If you’ve never experienced a Kingfish smoking off hundreds of yards of line in a matter of seconds then you’re not doing yourself justice as a fisherman! They also are big favorite for cooks to put on the smoker that can result in an amazing fish dip. One of my personal favorite things to do while on the way out to my nearshore fishing grounds is to run the beaches in hopes of spotting a Tripletail. I swear Tripletail are God’s gift to fishing guides. They can be easy to find, dumb, fight like hell, and definitely one of the best white flaky fish in the world to eat. A well placed free-lined shrimp or cut bait almost always gets them to eat! One thing about this time of year that I truly love is that our waters are so quiet and desolate from the lack of tourists. It’s not that uncommon to not see a single boat during your weeks venture to your favorite fishing holes. I’m sure the fish appreciate it just as well and are not as “spooky” when approached. As you can see, Fall can not only be one of the nicest times of the year for weather but fishing too. 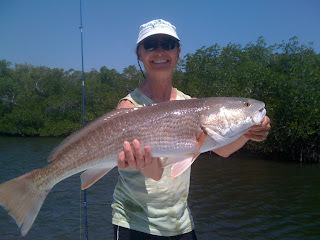 Make sure to book your charter and get in on Fall fishing off the islands of Fort Myers and Sanibel Islands. You can book a charter with Capt. Matt or our other Endless Summer Charter guides at 239-691-1966. Just heard on the news that the State of Florida could be sunned-in for the next several days. Residents have been urged to proceed quickly to the nearest beach and/or tiki bar for further instructions. We are asking our friends and relatives to the north to keep us in their thoughts & prayers!! Seriously though…we have had some awesome weather and fantastic fishing in the Sanibel and Captiva Island waters. This time of year the bigger fish are pushing off shore to deeper waters and the smaller of the same species are in abundance. We are catching 50-70 fish during a charter which includes redfish, snapper, sheephead, flounder and trout to name a few. We have even caught a few snook despite the fact that they get closed-lipped this time of year. You may not catch that trophy this time of year but the action is non-stop! Just about the time your bait hit the water the fish are practically meeting it at the waterline to gobble it up. So, if you like a lot of action and like to take home some fresh meat for dinner this is the time to take a charter with Endless Summer Charters! Don’t forget, tarpon season is just around the corner! The hunt for the Silver King is on!